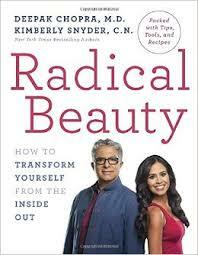 The book Radical Beauty starts off with a dedication to the reader: "May you fully accept and embrace the unique Radical Beauty that you already are." Three hundred and five pages later, you have presumably transformed your already perfectly fine Radically Beautiful self into . . . an even better version? Unsettling dedication aside, the book is full of information, advice and recipes to help make healthy lifestyle changes. With the start of the new year, nearly everyone is looking for a fresh start and this book has many great ideas to put that new motivation into action. Divided into 6 "Pillars" (Internal Nourishment, External Nourishment, Peak Beauty Sleep, etc. ), the book aims not to sell readers on the latest fad diet or cosmetic or exercise routine, but rather to make women feel better and regain their confidence in their own skins. Instead of seeing beauty as a temporary and constantly elusive quality, every woman can achieve her own beauty that is unique and doesn't rely on comparisons either to others or some societal, impossible ideals. Pillar one takes a very thorough and informative look at how the foods we eat impact on our outer appearance (oily skin, dull hair, brittle nails, etc.) as well as our overall health. While everyone knows this in theory, the way the authors break down and explain the good and bad foods (and why they fall into these categories) is very interesting. I especially like how each author gets his or her say. For instance, Kimberly Snyder sees no use for dairy in modern diets at all, while Dr. Chopra feels it can have a place at the table, in moderation. Seeing that the experts have a hard time coming to consensus on dietary advice even for a chapter in a book helps to illustrate how seriously confused the average consumer is! The nutritional portion of the book is the largest chapter and contains lots of practical advice. One idea I liked was the suggestion to "visualize" all the gross things that are going on inside your body as it tries to digest a large or unhealthy meal. If that doesn't have you running for the kale aisle in the grocery store, nothing will. The other sections of the book deal with such topics as ingredients to look for (as well as those to avoid) in beauty products, advice on getting a good night's sleep (and the detrimental effects of not doing so), best practices for beauty based on the seasons, ways to make your home healthier and of course, the benefits of exercise. There is a section on yoga practices (complete with photos!) and what each pose does to benefit the body (I don't care how beneficial it is, I still have no hope of achieving pyramid pose in this lifetime). The final pillar in the book deals with attaining spiritual beauty including ways to be kind to yourself and stop negative thoughts and self-criticism. This section also includes helpful information on meditation and combating stress. The book ends with some Radical Beauty recipes, although as with most recipes, there are plenty of ingredients that you are unlikely to find in your kitchen (garam masala? tamari? Anyone?). Still, the book is very educational and inspiring, although it is so packed with suggestions that it would be difficult to follow all of them. If you're looking to improve your physical and emotional health, however, you can find plenty of ideas in this book.